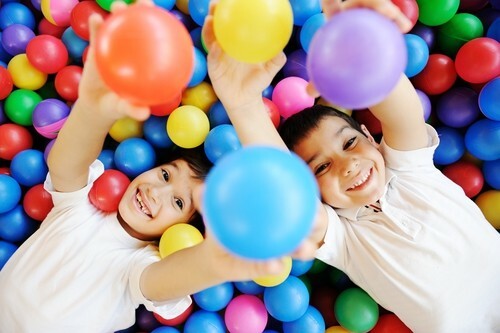 Motor play provides critical opportunities for children to develop both individual gross and fine muscle strength and overall integration of muscles, nerves, and brain functions. Recent research has confirmed the critical link between stimulating activity and brain development. Young children must have ample opportunities to develop physically, and motor play instills this disposition toward physical activity in young children. A variety of opportunities for children to engage in social play are the best mechanisms for progressing through the different social stages. By interacting with others in play settings, children learn social rules such as, give and take, reciprocity, cooperation, and sharing. Through a range of interactions with children at different social stages, children also learn to use moral reasoning to develop a mature sense of values. To be prepared to function effectively in the adult world, children need to participate in lots of social situations. Constructive play is when children manipulate their environment to create things. This type of play occurs when children build towers and cities with blocks, play in the sand, construct contraptions on the woodworking bench, and draw murals with chalk on the sidewalk. Constructive play allows children to experiment with objects; find out combinations that work and don’t work; and learn basic knowledge about stacking, building, drawing, making music and constructing. It also gives children a sense of accomplishment and empowers them with control of their environment. Children who are comfortable manipulating objects and materials also become good at manipulating words, ideas and concepts. Children learn to abstract, to try out new roles and possible situations, and to experiment with language and emotions with fantasy play. In addition, children develop flexible thinking; learn to create beyond the here and now; stretch their imaginations, use new words and word combinations in a risk-free environment, and use numbers and words to express ideas, concepts, dreams, and histories. In an ever-more technological society, lots of practice with all forms of abstraction – time, place, amount, symbols, words, and ideas – is essential. Developmentally, most children progress from an egocentric view of the world to an understanding of the importance of social contracts and rules. Part of this development occurs as they learn that games like Follow the Leader, Red Rover, Simon Says, baseball and soccer cannot function without everyone adhering to the same set of rules. The “games with rules” concept teaches children a critically important concept – the game of life has rules (laws) that we all must follow to function productively.